Save More Money With Family Dollar’s SmartSpins! You are here: Home / Great Deals / Save More Money With Family Dollar’s SmartSpins! 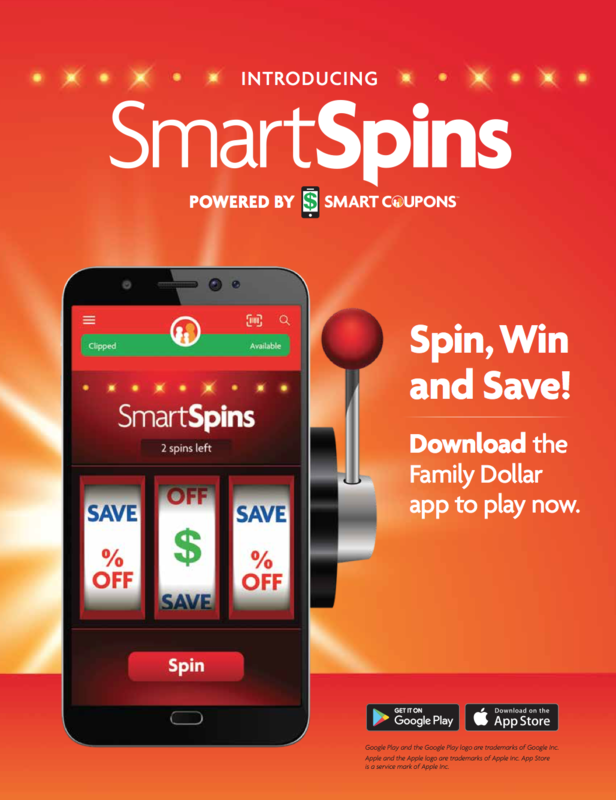 If you think you’re saving a lot of money NOW when shopping at Family Dollar, wait until you try the SmartSpins game in the Family Dollar App! This new game in their app is a game changer when shopping at Family Dollar! This is a game that rewards you every time you shop at Family Dollar! PLUS, it’s super easy! 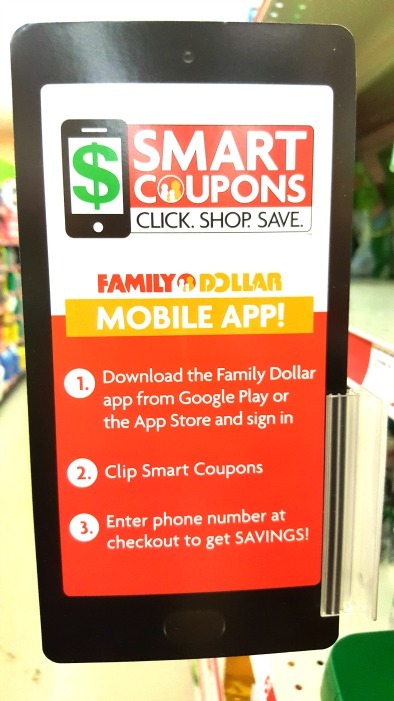 Visit the Family Dollar App page on the site to sign-up for Smart Coupons and download the app. You can also download the Family Dollar App directly on your phone, from Google Play or the Apple Store. Remember, you must have a Smart Coupons account and have the latest app version to be able to use SmartSpins. When paying for your purchase, have the cashier scan the barcode in your app or enter your Smart Coupons ID on the pin pad . You will earn a spin in the app game. 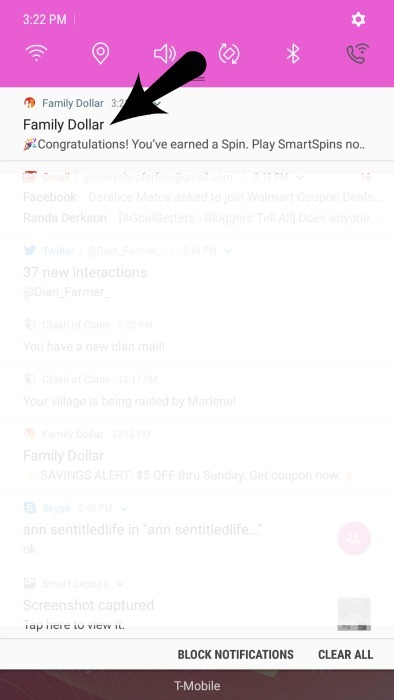 You will be notified via a message in your app inbox as well as a push notification. 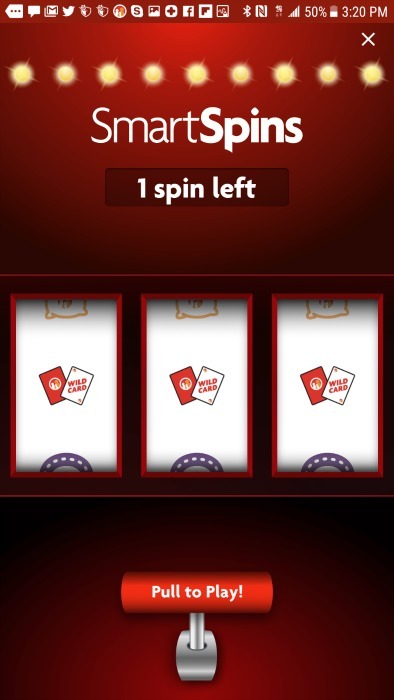 A banner will also appear in the app that will show you the available number of spins you earned from your purchase. 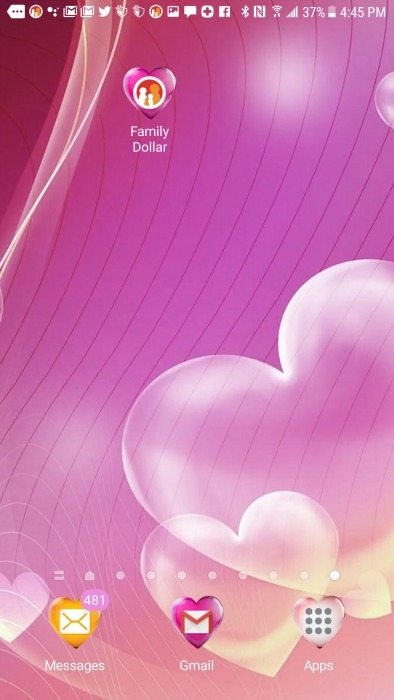 Click on the banner to spin and win! 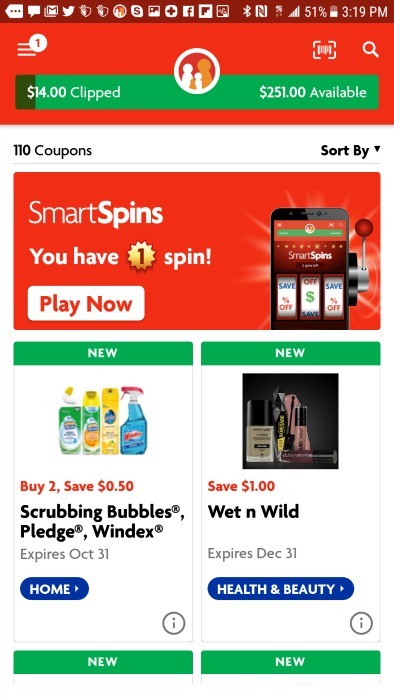 Why Should You Use The Family Dollar App and SmartSpins? This app makes it even easier to save at Family Dollar. You can get quick access to deals and sneak previews of the new offers to come. You will be impressed by the wide selection of savings and coupons. Enjoy instant access to Smart Coupons. No need to carry any loyalty cards in your wallet as your account is accessible in your smartphone. No more coupons to print and cut! You can view your coupons anytime. Signing up is a breeze: Just provide your 10-digit phone number, name, email address, and preferred password! 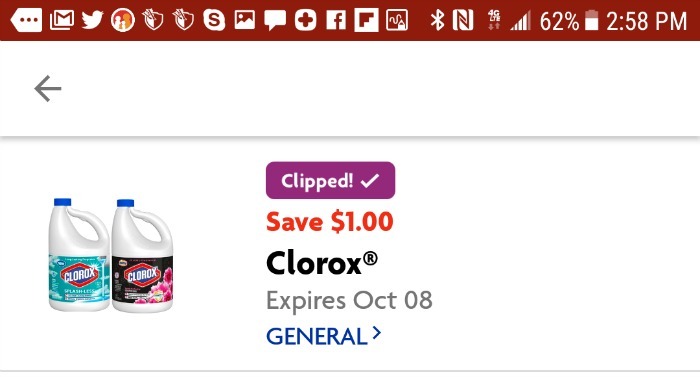 I LOVE that you don’t have to print or clip coupons. 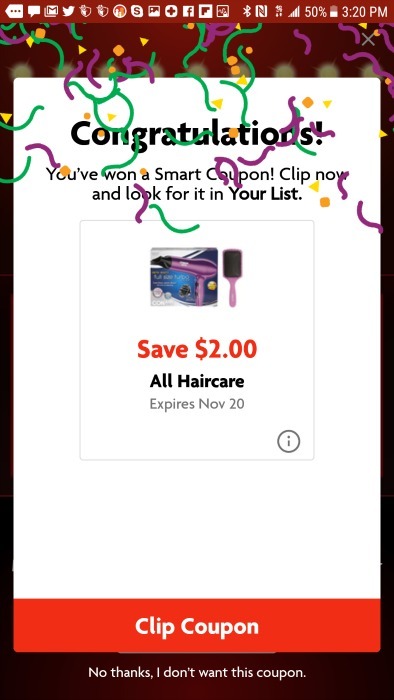 So many people these days find it harder and they don’t have time for all of that, so Family Dollar has made it super easy with the coupons in the app AND the SmartSpins game. Its rewards are like icing on the cake! The app is super simple to use and showing the bar code in the app to the cashier makes coupon savings easier than ever! I am also thrilled that Family Dollar has gone even further to make our shopping experience easier and less frustrating. I cannot tell you how many times over the years that I have tried following the coupon and store policy to a “T” when shopping and presented my coupon(s) to the cashier and then I hold my breath hoping the register doesn’t beep as they scan my coupon(s)… it’s so frustrating. It’s frustrating because I think I did it right, but, sometimes it beeps. It’s frustrating for the cashier, too, because usually they only know that the register beeped – it doesn’t explain why, and then there are the people backing up behind me getting anxious because I am wasting their time. BUT, Family Dollar has fixed this EXCELLENTLY! 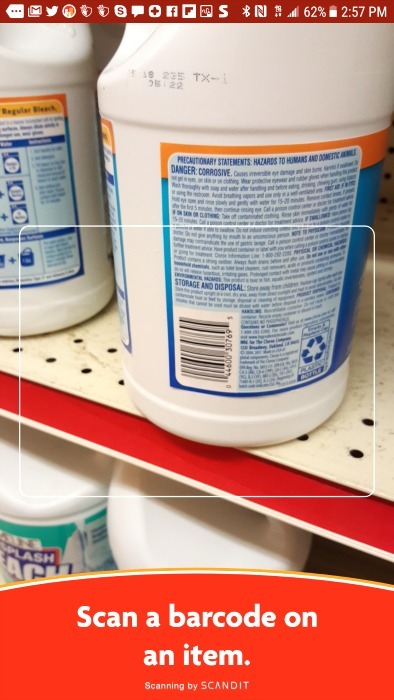 There is a bar code scanner right in the app that will tell you if you have the right item that matches that coupon! How awesome is that?! No more confusion or frustration – and it makes the checkout move smoothly. 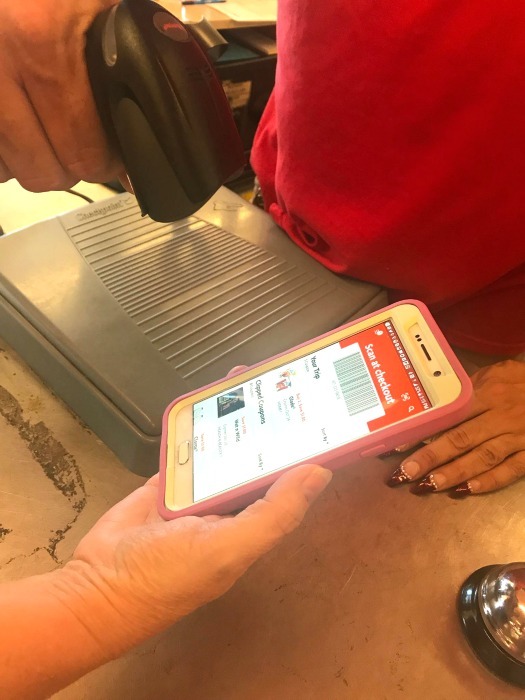 With the bar code provided in the app you just show the cashier the bar code for your coupon savings and it’s just one scan – not 27 coupons and some run and some don’t. Y’all coupon, you know what I am talking about! 🙂 So, I am a FAN of this game and this app – they thought of everything! Deals/items shown/discussed are subject to availability and may vary.